"duh hey you're a regular Picasso"
9/20/2015 9/20/2015 by tom moody Comments Off on "duh hey you're a regular Picasso"
Fracture is not only a painting tool, it is a real-time video and still image mixing application that allows users to create portraits like those painted by Pablo Picasso and Georges Braque in the early 1900s through the iPhone and iPad's cameras. In pre-technological times, you had the artist, a technical magician, the public, who mostly stood in respectful silence absorbing the art, and various church/state middlemen who sponsored it. In the present, you have a technician making some visual magic (in the above case, a surface imitation of a period style), the public, which mostly pokes at their phones like an orangutan might, and the corporate state, which profits from the sales of phones and apps. The band DEVO might use this as an example of de-evolution. Even JODI.org has gotten into the act, making a little stick man that does something when you shake your phone. The people in the demo video look very confused about what's supposed to be happening as they go outside to swing their phones around in the air, blow on them, etc. They resemble an adult kindergarten class, and not in a good way. Given the incredible power of the handheld device, which is daily relied upon by millions of people while also marketing to them and surveilling them, carving out a space for aesthetic experience through the device seems particularly important. 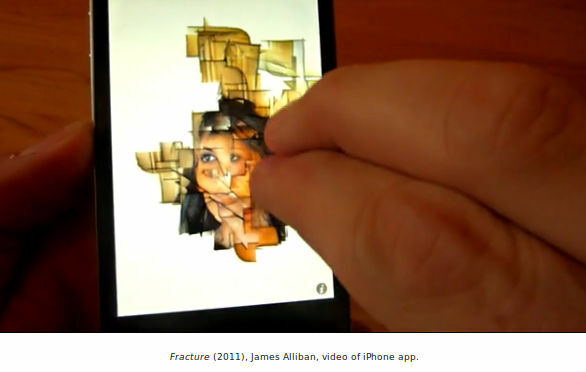 Not just any handheld device -- these "art" apps are all specifically for Apple phones and pads.